In the nearly 14 years Doctor Who has been back on TV, the Daleks have been built up as the most fearsome army in Time and Space, and then broken down to deconstruct the very idea of what a Dalek represents. But Doctor Who’s New Year’s special brought them right back to 2005's “Dalek”—and finally nailed a balance the show aimed for all season long. In many ways, “Resolution” feels like a much more successful version of series 11's finale, the solid if jaggedly divided “The Battle of Ranskoor Av Kolos.” While the finale tried to awkwardly marry its character arcs (mainly Ryan and Graham’s relationship) with grand stakes to the point that none of the stakes ever felt like they mattered, “Resolution” did a much better job of balancing its character work—once again primarily filtered through Ryan—with a traditionally Doctor Who-y story about monsters, death, and destruction. It gave us the best of both worlds. In Ryan’s tempestuous reunion with his absent father, the personality-driven drama that made season 11 feel so unique shone bright. And in its take on Doctor Who’s most iconic monster, “Resolution” gave us an explosive re-centring on just what the Daleks should be, with a twist that makes them craftier (and scarier) than ever. The Daleks—despite being hate-screeching pepperpots that exterminate first and then scream supremacy-laden rants second—are a surprising delicate creature for Doctor Who to handle. They are, of course, iconography so fundamental to the fabric of the show that even people who don’t watch know what a Dalek looks like—and there is an expectation built into that. You can’t not use them, and Doctors are defined by their encounters with the race more than almost anything else they do in their eras. The weight of that expectation, and their constant re-use, has in equal measure both turned the Daleks into a bit of a joke and made them predictable to the point that—since 2005's “Dalek” specifically addressed all that joking by reforging a lone Dalek as a terrifyingly powerful force of destruction—the show has since gone on to tweak and deconstruct the idea of what a Dalek story can be. They’ve been grand armies of disposable units that exist to get blown up, rendering their threat impotent, and they’ve been literally clambered about inside to discover the true core of what a Dalek is as a being. All that poking and prodding has turned the Daleks more into an esoteric ideal revolving around the Doctor’s own ethical choice to battle pure evil, rather than necessarily a creature to be fought. “Resolution” however, went all the way back to “Dalek”—sometimes literally, with action set pieces directly mirroring sequences from that nearly 14-year-old episode—to reinvigorate the potency of their threat. The recon Dalek we meet in this episode, pulling parts of itself back together to resume its mission as the herald of Dalek invasion, is an embodiment of pure hatred. It doesn’t need an army of its brethren to carve a bloody path throughout the episode, in and out of its casing—a twist that makes this “new” Dalek much more sinister and skulking than they usually are. This reforged Dalek is raw and rough around the edges, but still unstoppable and almost satisfyingly murderous. Stories like “The Army of Ghosts/Doomsday” or “The Stolen Earth/Journey’s End” tried to amplify the threat of the Daleks by upping the sheer quantity of them, but “Resolution” reminds us that all Doctor Who needs is one angry, crafty pepperpot to tell an action-packed adventure epic—and one that weaves rather brilliantly with the smaller-scale stakes Chris Chibnall’s debut season of Who has built itself on. Initially, those more personal stakes caused a few cracks in the sheen of “Resolution.” The slow burn with Ryan’s father Aaron awkwardly re-entering his son’s life after Grace’s death battled with the shell-less Dalek (sneakily puppeting its poor human drone Lin about in its quest to rebuild itself) in a scrap that threatened to bring the pacing of the episode screeching to a halt in its first half. 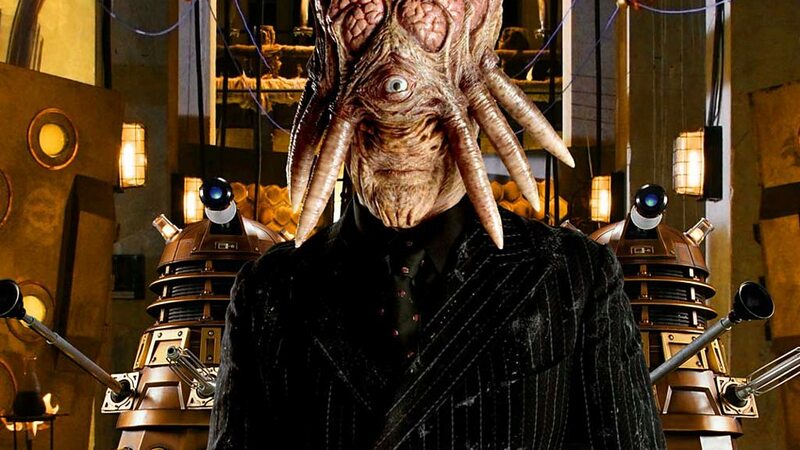 But when all Dalek-based hell broke loose in the back half, and Aaron found himself dragged along for the ride, “Resolution” deftly managed to bring the two storyline’s together—literally, when the seemingly destroyed Dalek managed to sneak up and bond itself to Aaron’s body—to remind us of an age-old Doctor Who-ism: the power of teamwork, the power of love, can overcome even the most visceral hatred and cruelty. In saving Aaron from being roasted to a crisp alongside the Dalek—being there for his father, despite the fact his father was rarely ever there for him—Ryan resolved his own internal grief and feelings of abandonment, setting up the possibility of reforging that relationship. The Dalek, arrogant to believe that as the best of its kind it could stand alone on the ashes of humanity as the vanguard of its race, can’t compete with even the simple act of a son reaching out to his father in love, and is ultimately defeated. “Resolution” might not have been as idea-driven as the highest highs of Doctor Who’s 11th season, but in sacrificing some of that existentialism to tell a classically Who-vian story—one that still deftly managed to resolve one of the biggest character arcs it had built up over the past season—it delivered a great template for its next season to build on. Doctor Who can tell so many kinds of stories, from the straight-up monster-laden action to heady tales of morality, but it is arguably at its best, as it was here, when it naturally manages to mix the both of them. And throws in a scary killer pepperpot for good measure. UNIT being undone not by catastrophic alien invasion but instead austerity-related funding cuts might be the only good Brexit-adjacent joke that’s ever been made. Speaking of which, the set up of the Dalek shutting down the UK’s wifi and TV signals just for a throwaway scene of a horrified family discovering that they may actually have to talk to each other on New Year’s Day might be the most Russell T. Davies-style gag the show’s done in years. Important to the plot? Not at all. Delightfully silly? Absolutely. I loved the rough and mean take on the Dalek design in this episode. It looks inherently wrong and slapped together—it works because it’s not a new template for the Daleks going forward but instead because it’s this slapdash thing soldered together out of odds and ends and scraps of actual Dalek. Plus, you get the fascinating parallel between “Resolution” and “The Woman Who Fell to Earth”—both the Doctor and her greatest enemy, reforged in the crucible of Sheffield steel. How long is a Rel, the Daleks’ preferred measurement of time? Well, fact fans, according to the 2007 episode “Evolution of the Daleks,” it’s about 1.2 seconds. To be fair though, it’s easy to forgive the Doctor forgetting the events of that rather turgid Dalek story. And that’s that for Doctor Who this year! It won’t be back until 2020, but hey, at least we got the decent news that it might be “very early” into 2020, so we won’t be waiting that long. I’m gonna spend the year hoping that now that both Graham and Ryan’s arcs have been properly resolved, they can step out of the focus a bit and really let Yaz get some meaty storytelling to grapple with. Can 2020 be the Year of Yaz?